Click on the directional buttons to view photos from the Ribbon Cutting Ceremony. 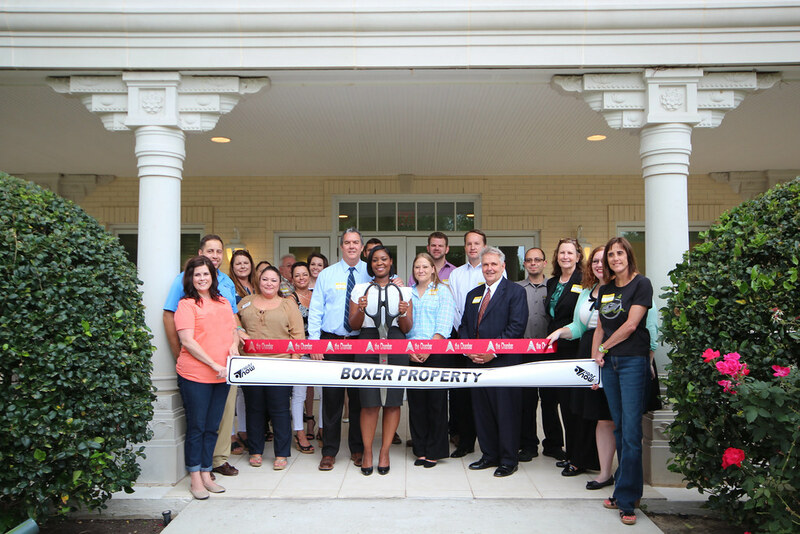 (HOUSTON, TX) – Houston-based commercial real estate firm, Boxer Property, is excited to announce a ribbon-cutting event in conjunction with The Woodlands Chamber of Commerce celebrating the grand opening of 10210 Grogans Mill Road taking place on Friday, May 19, 2017 at 11:30 am. Tenants and local business owners in the area are invited to join the celebration as The Woodlands Chamber of Commerce welcomes its newest member to the community. A complimentary brunch with mimosas will be served and participants will have the opportunity to network while they tour the executive office suites at Boxer Property’s first managed office complex in The Woodlands area. Attendees are also encouraged to bring their business cards for a chance to win great prizes at the ceremony’s raffle drawing. The 3-story, lakeside property at 10210 Grogans Mill Road features 19,557 square feet of office space for lease in The Woodlands, TX. The office building is a modern interpretation of Vedic architecture and consists of co-working spaces, dedicated desk spaces, and a variety of uniquely configured executive suites with many including bathrooms and showers. Tenants will enjoy a myriad of amenities available at 10210 Grogans Mill Road including free Wi-Fi of 1000 MBPS, furnished office spaces, landscaped grounds, lakeside views, and easy access to numerous shops and restaurants in the vicinity. Tenants of the building will also receive access to an online Tenant Center and on-site maintenance services for further convenience. The property was recently acquired by Tim Young, founder of Kicks Indoor Soccer, Inc., who is now making this energy-rich and unique office space, originally designed to promote peace, harmony and success, available to meet the needs of innovative entrepreneurs of all sizes.